Waited here for the free medium coffee. From a coupon in the mail – can’t beat free coffee, to go please. 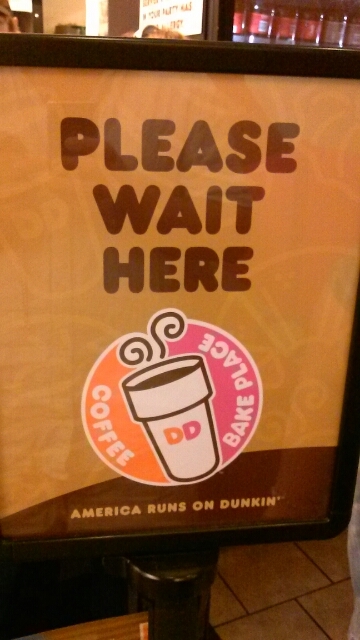 America Runs on Dunkin… and waits here for the coffee. You can check out the fresh donuts while you wait. Mornings are usually very busy, both inside and in the drive-thru line because everyone, well most everyone, is on their way to work and gotta have that coffee to go. The wait wasn’t long – barely had time to take this in-store picture. Good times at the DD.